The adventures of Li-lin, a Daoist priestess with the unique ability to see the spirit world, continue in the thrilling follow-up to the critically-acclaimed historical urban fantasy The Girl with Ghost Eyes. It’s the end of the Nineteenth Century. San Francisco’s cobblestone streets are haunted, but Chinatown has an unlikely protector in a young Daoist priestess named Li-lin. Using only her martial arts training, spiritual magic, a sword made from peachwood, and the walking, talking spirit of a human eye, Li-lin stands alone to defend her immigrant community from supernatural threats. Now Li-lin has gotten her hands on an amulet that makes its bearer bulletproof. But there’s a problem: the amulet is powered by a child’s soul. To save the spirit, Li-lin will have to voyage to Fengdu, the City of the Dead, but first she must protect the amulet from the gangsters who want it for themselves, her own father, a renowned Daoist exorcist who wants to destroy it, and the Ghostkeeper who created the amulet by murdering his own son. 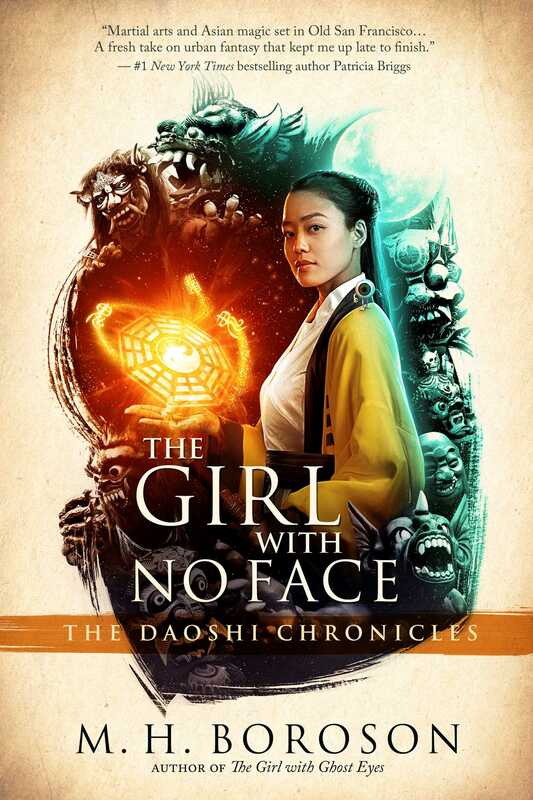 With hard historical realism and meticulously researched depictions of Chinese monsters and magic that have never been written about in the English language, The Girl with No Face draws from the action-packed cinema of Hong Kong to create a compelling and unforgettable tale of historical fantasy and Chinese lore. "A brilliant tale of magic, monsters, and kung fu in the San Francisco Chinatown of 1898 . . . smoothly mixes Hong Kong cinema with urban fantasy, and Li-lin is a splendid protagonist whose cleverness and bravura will leave readers eager for her future adventures." "Packed with evocative imagery of the multitudes of spirits lurking just out of sight. Li-lin is a strong, determined character, but Boroson doesn’t make her wildly anachronistic for her time, imbuing her with filial loyalty and a respect for her culture that should not be called meekness." "A thrilling world of kung fu, sorcery and spirits. . .The pace never slows, offering a constant stream of strange characters, dire threats, and heroic actions that makes the book a compelling page-turner." "A joy to read. Set against the backdrop of turn-of-the-century Chinatown, Boroson’s tale blends fluid, kinetic martial arts sequences with grotesque creatures and enough dramatic tension and pathos to hook readers and keep them." "Li-lin is one of my all-time favorite female characters after reading this book; I simply fell in love with her ... I expect to see The Girl with Ghost Eyes on lots of “Best of” lists this year. It’s certainly going to be on mine. Highly recommended." "Masterful writing ... Boroson has has done his research quite extensively, and he’s approached every aspect of the book with thoughtfulness and respect ... I am absolutely ravenous for more of Li-Lin’s story."